NASA photo from their Twin Otter aerial survey plane. 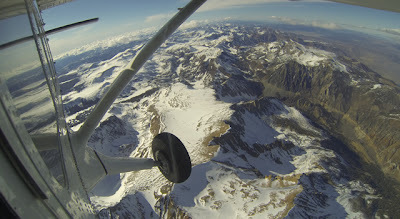 NASA has launched a new airborne mission to map the entire snowpack of the major watersheds in California and Colorado. NASA will use the latest technology to more accurately measure how much water these watersheds hold. The three-year “demonstration” mission includes weekly flights during the snowmelt season from April to July. A Twin Otter aircraft is equipped with equipment to determine snow depth, as well as snow water equivalent. Snow water equivalent represents the amount of water in the snow on the mountain. It is used to calculate the amount of water that will run off. An imaging spectrometer is used to measure “snow albedo”, which is a measure of the amount of sunlight reflected or absorbed by the snow. The albedo indicates the speed of the snowmelt and timing of its runoff. All of this fancy snowmelt information will help water reservoir operators perform better flood control and water supply management. These aerial surveys will be available to everyone on a weekly basis. Backcountry skiers and riders will have access to weekly, detailed, snow reports in remote areas. Snowmobilers will know where the best bowls and basins are and hikers will know when a particular trail is clear of snow.